The Bogle family has been farming in California since the mid 1800s, but it wasn’t until 1968 that father and son, Warren and Chris Bogle, planted wine grapes in Clarksburg, California, 14 miles south of Sacramento in Yolo County along the Sacramento River. Today Bogle farms over 1,200 acres in the Sacramento Delta region. The winery was established in 1979. Patty Bogle took over operation of the winery in 1989 and her husband Chris ran the company's agricultural program until he died in 1997. Chris and Patti Bogle met while students at Linfield College in McMinnville, Oregon. Their son, Warren Jr., took over as the company's vineyard manager and became president in 2002. A daughter is secretary of the board of directors, and the youngest son, Ryan Bogle, is vice president. Patty Bogle died in 2011 from leukemia. Initially the Bogles sold their grapes but in 1979, they began producing 4,000 cases annually. Today, they ship more than 1.2 million cases of wine and operate production facilities in Clarksburg and throughout Northern California. The were ranked as the country's 14th-largest winery in 2011. 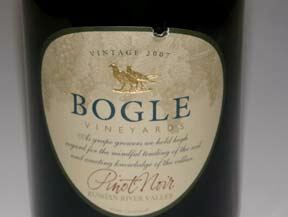 Bogle is better known for several varietals other than Pinot Noir and is probably the largest California producer of Petite Sirah. Beginning with the 2003 vintage, they have hit the mark with value-priced Russian River Valley Pinot Noir in some vintages. There is widespread retail distribution of this value-play Pinot Noir.